World War II is a few months from ending. The Germans have been repelled, and it’s only a matter of time before the Allies prevail. Troops are on the move, as are many soldiers and staff who provide administrative support for the war effort. Pascale Tailland, an American translator, has been stationed in Germany, but now her unit is reassigned. The novel opens with Pascale and her fellow WACs on the train awaiting departure. She catches sight of a blond-haired youth whom she correctly assesses is a refugee. He is “gaunt, hardened, and bleak” but despite his desperate appearance, something is familiar. At the last minute, she pulls him aboard the departing train. And with one touch, Pascale is aware that this slender youth is not a man. The Polish Bronia “Bron” Rukowicz is passing herself off as Witold Rukowicz. She’s escaped one forced labor camp and with cunning and verve is doing all she can to stay away from the horrors of the war. She has no desire to go back to the deprivations in Poland. After all she has been through, she is closed off emotionally. In conversation over the next few hours, Pascale gradually draws out the aloof refugee. When Witold tells Pascale that life is basically “cruelty, wars, and massacres,” Pascale insists that life itself gives meaning. Witold is quick to counter: “The only meaning I see is the law of the wolf, kill or be killed” (p. 22). She has stopped believing in goodness or altruism. This, the way of the wolf, has been the refugee’s defense against the horrors she has encountered. For the rest of the short time they travel together, Pascale puts herself on the line in order to prevent Witold from being discovered and either captured or sent off to a refugee camp. By the time the two part, Pascale has made a crack in carefully constructed defenses, and Witold has fallen head-over-heels for the American. Pascale is also smitten. What follows is the fascinating, engrossing tale of these two women trying to find one another again in the chaos of the war-torn countries of Europe. Bron continues her masquerade as Witold, and her situation is much more dangerous and unpredictable. Both women have to find trustworthy helpers in order to track one another. Pascale’s search and Bronia’s arduous journey make for a gripping tale. I couldn’t put this book down and read far into the night until I reached the surprising conclusion. Clarke’s prose is fluid and literary, and she knows her history, not to mention more than a smattering of several languages. The details about Bronia’s persistent attempts to survive are particularly rich. For instance, at one point, while locked up in the hospital ward of a camp, she is considering all possibilities for escape, and she realizes “every place could be escaped from if you looked hard and thought like a mouse.” Bron’s resourcefulness—and resilience—is truly a miracle. 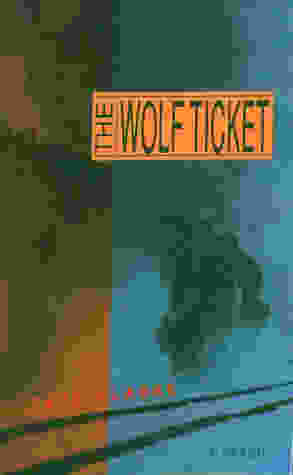 The Wolf Ticket is one terrific story. I highly recommend it and wish Clarke would publish another novel with great speed.